So, I told you the laundry room is coming little by little, so I'll try to show you a little each day. 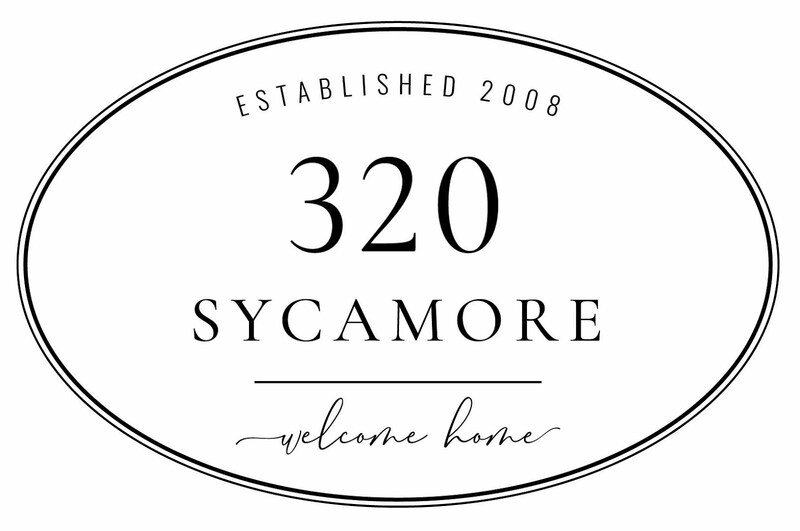 Some great news: remember the Ethan Allen desk and hutch from the $35 yard sale? Remember how I ran back to measure to see if it would fit? I wanted it to fit in my laundry room and it does~perfectly! Eventually, it will probably end up in one of my daughter's room. But for now, it's going to be my work space in the laundry room. Hey, I'll take what I can get. :) The kitchen desk is much more of a family area, so I want to make it into a little space I can love and retreat to. So, for my first baby steps, I painted the backboard Grasscloth by Behr (this is the same color Rhoda used in her laundry room). Then I added the pottery barn plates and candlestick from that same wonderful yard sale. 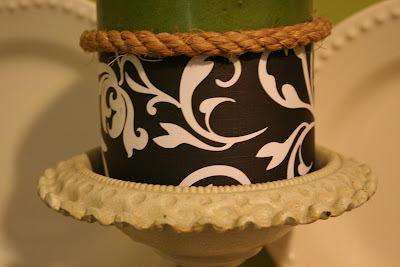 For the candle, I simply took a big, fat, green candle from TJ Maxx, cut a strip of scrapbook paper from Michaels and wrapped it around the bottom, and then took a piece of rope and tied it between the two. Oh, and do you know what really helps me make progress? And you can get one for 99 cents now until July 24th on Sonic's website. But warning: once you try one, you'll be going back for more. I've used every email I've ever had and will be using my husband's next. Sonic Guy: "Hey lady, weren't you just here getting one these a couple of hours ago??" Love your blog- You are so creative!! I have been DYING to try a Sonic Chiller, but every time I've been near Sonic (sadly, there isn't one in my town) it's been an "inappropriate" time. As if there could be an inappropriate time. HA! Hmph. I think I'll go get one this afternoon when the baby gets up from her nap! What a great yard sale find! Love the paint choices! And yes, Sonic Chillers are addictive!!! Maybe that is my problem? We don't have a Sonic! Now I want a chiller so bad and have to watch the commercials and yet there is not a Sonic within about 100 miles! That is just cruel! i have to admit your post had me at sonic chillers. unfortunately my town doesn't have a sonic ( i know how does life go on without a sonic?) but i'm seriously thinking about taking the 2 hour drive to get one. Funny how something will bring a favorite blogger to mind. Today I went to my neighbor's garage sale. She had a low, two drawer dresser on wooden wheels for $10. I thought- wonder what I could do with that? Think like Melissa, think like Melissa. Ha! I thought I could paint that and use it for a coffee table to add a big splash of color. I could just use it in the spare bedroom, I need a couple drawers in there.....As I was thinking, a crafty garage sale shopper (no doubt)- bought it. I was just warming up for the project, too. *sigh* It takes me years to do a project, generally. I love the Cherry Limeade Chiller, too! Thanks for the link. Looking good so far! Ok, how in the world are you doing these super cute home decorating/improvements with 5 kids?! I have 2 and can barely get anything done, lol. Pretty little vignette with the candle and plates! Oh, I'm loving that shelf!! That looks great, girl. I hope you're getting over the shock of Grasscloth & loving it now. 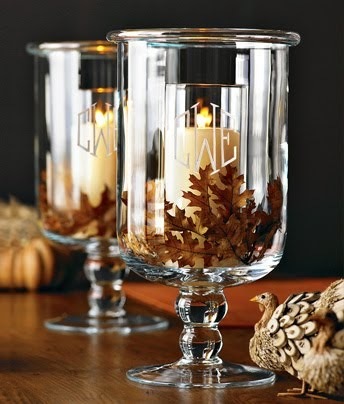 That sure looks great with your candle & plates. Divine. I will have to try those Sonic chillers. There is one just down the street from me. Dangerous! What a great price for the desk! Very nice job...can't wait to see the rest! Ugh, the closest Sonic to us is just about an hour away!!! Oh that green is pretty! I can't wait to see your room when it is all finished. Oh my, that green is DIVINE. I love it with the white plates. I've never had a Sonic Chiller, but if they're THAT helpful, then I NEED to try one. Love it all! It is gonna be fantastic, I just know it! And by the way, my boys had 2 cousins visiting this past week. They are 6 and 10. In addition to my 2 and 4 year old I was a hot mess all week. How you do it with 5 everyday I will never know. Kudos to you my friend. I seriously respect what you do daily. The laundry room is going to look fantastic and be such a cheerful place. I can't wait to see the finished product. 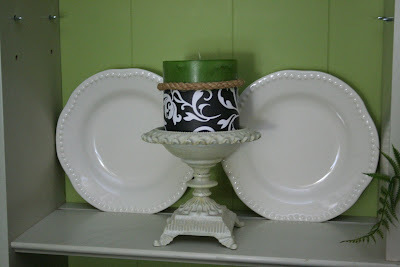 I LOVE the Grasscloth green paint color---the candle and plates look so pretty. Your laundry room will be a fun and inviting place to go. The next problem will be how to get Melissa OUT of the laundry room. heehee! Come on over for the give away this week. Oh and we MUST go to Sonic. I almost painted my kitchen grass cloth. It was painted in a tiny section, but didn't look wonderful with the light in my kitchen. I'm glad you picked the green!!! This post just made me laugh out loud! I just had my very first strawberry slushee from Sonic yesterday. I looooooooovvvveeddd it!!! I love the green color. Beautiful! Love the candle with the rope. Totally copying that! And thanks for the tip about the Sonic Chillers. I've never had one before, but I just got two coupons. Can't wait to try one! Wish I had known about the Sonic coupon! I have been meaning to try one of those. Of course I am already addicted to their sweet tea during Happy Hour! :) I was also one of the ones rooting for the green(didn't know that it was Grasscloth) which is what I have in my kitchen and love it! Your laundry room is looking great so far. I have seen that quilt at TJ Maxx and love it! You are so inspiring, thanks!